The recent passing of Leonard Nimoy prompts me to recall a lesser-known connection between the great man and the theory of (cusped) hyperbolic 3-manifolds, observed by my friend and former mentor Iain Aitchison. In particular, I am moved to give a brief presentation of the (unpublished) work of Aitchison on the theory of manifold-realizable special polyhedral orthocentric curvature-K complexes — or Mr Spock complexes for short. If is a point, if is a hyperbolic geodesic ending at the distinguished point at infinity, and if is the foot of the (hyperbolic) perpendicular from to , then is the foot of the (hyperbolic) perpendicular from to . The map takes geodesics/totally geodesic (hyper)planes to segments of geodesics/convex subsets of totally geodesic (hyper)planes. 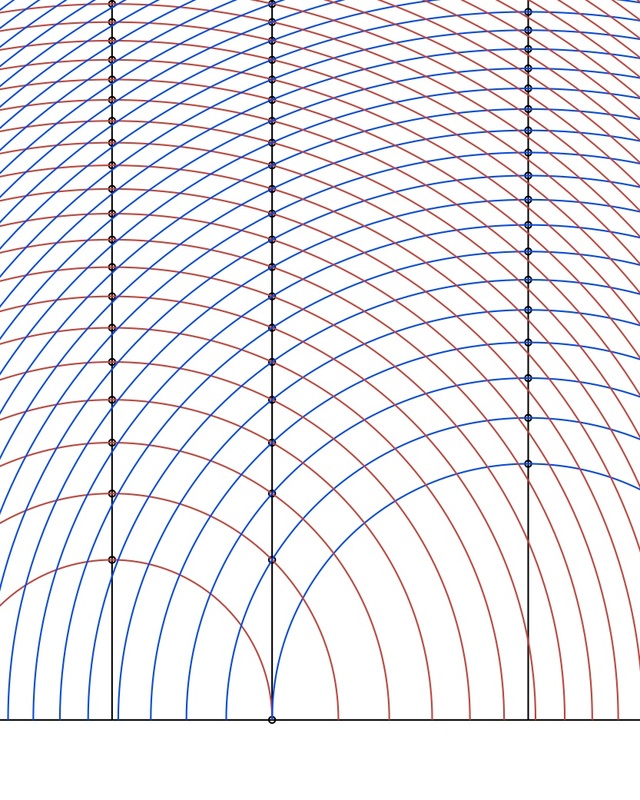 These geometric properties are illustrated in the figure; three points on three vertical geodesics are shown, along with their images under a discrete set of values of the Aitchison-Wildberger map. The “outermost” points are the feet of the perpendiculars from the “middle” point to the “outermost” geodesics. Fact 3, that hyperbolic geodesics are taken to segments of hyperbolic geodesics (and similarly in higher dimensions), follows from facts 1 and 2. Note that the Aitchison-Wilberger maps are invariant under conjugation by parabolic transformations keeping infinity and the distinguished horosphere fixed. A hyperbolic transformation fixing infinity of the form conjugates to . Each polygon has two “competing” Aitchison-Wildberger maps, for the two different sides. Since the pair has normalizations (coming from the two sides) which differ by a reflection, the Aitchison-Wildberger maps commute. The universal cover contains a subcomplex , homeomorphic to a plane, stabilized by each parabolic subgroup of . Adjacent polygons in this subcomplex are at heights determined by the horofunction; thus they fit together in the upper half space in such a way that the canonical points are exactly at heights , so the Aitchison-Wildberger maps agree on their boundary segments. In particular, there is a canonical metric deformation of the spine through pieces which are the images under Aitchison-Wilberger map; rescaling the metrics to have fixed diameter, the curvature increases monotonely to 0 and we obtain a piecewise-Euclidean spine in the limit. 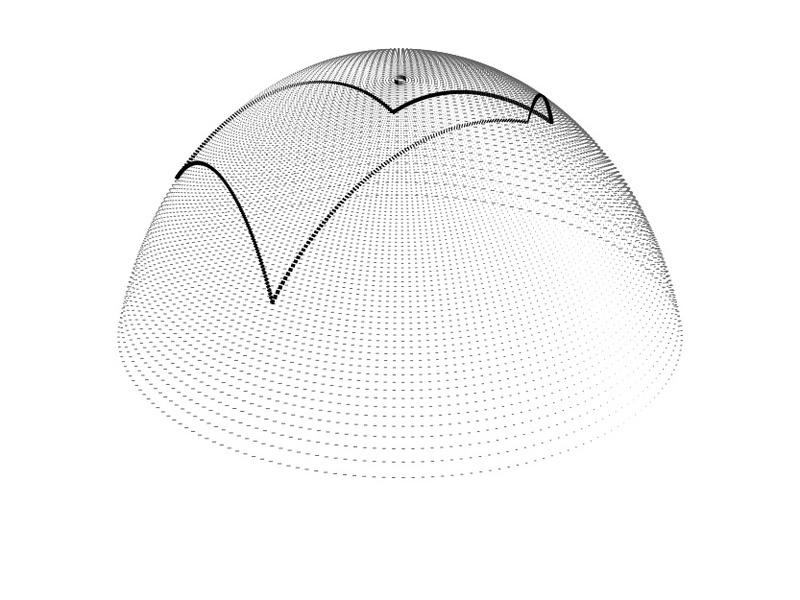 Another, more intrinsic way to see this deformation is to consider the canonical foliation of by geodesic rays heading out the cusp (this foliation is singular exactly along ). The horofunction tells us how to deform the metric at time as follows: at each point the tangent space splits as where is tangent to the foliation , and is perpendicular. Scale the metric pointwise, preserving the perpendicular splitting, by keeping the metric on fixed, and stretching by where . In this formulation it is more clear why the deformation is well-defined, but not at all obvious that it is constant curvature, away from the singular locus . In this way, the Aitchison-Wildberger maps “beam” Mr Spock up to the cusp as . This entry was posted in 3-manifolds, Hyperbolic geometry, Polyhedra and tagged CAT(K), Dirichlet domain, Euclidean structure, hyperbolic manifold, Iain Aitchison, Leonard Nimoy, Mr Spock. Bookmark the permalink.